Get a line-by-line account of the traffic flowing to and from specific addresses. Chart traffic origins to gauge the impact of regional traffic flow. See visual choke points such as equipment failures and keep an eye on other dangerous trends — all in real time. Find Access Control List (ACL) inconsistencies and protect your AWS services with proactive defense measures like ACL adjustments. Your website is the focal point of a mass of web traffic interactions, especially in a Virtual Private Cloud (VPC) setting. As your site’s footprint expands the incoming and outbound activity buzzing around it grows exponentially. To help get a monitoring handle on all this movement Amazon Web Services provides its customers with VPC Flow logging, which captures important data about all of your traffic, including the malicious kind. VPC Flow logs capture where data flow originated and where it was sent, what time and how much of it moved, the method used to move it (protocol, most commonly IP), and whether or not the data flowed as expected. Sumo Logic’s app makes makes interacting with this complex information easy. The alarm feature takes AWS logging to a new, proactive level of security. Instead of reacting to captured segments of network activity minutes after they’ve occurred, the Sumo Logic VPC Flow catches events as they happen and presents them in simple, interactive visualizations that make threat protection and avoidance easier than any other log analyzer. 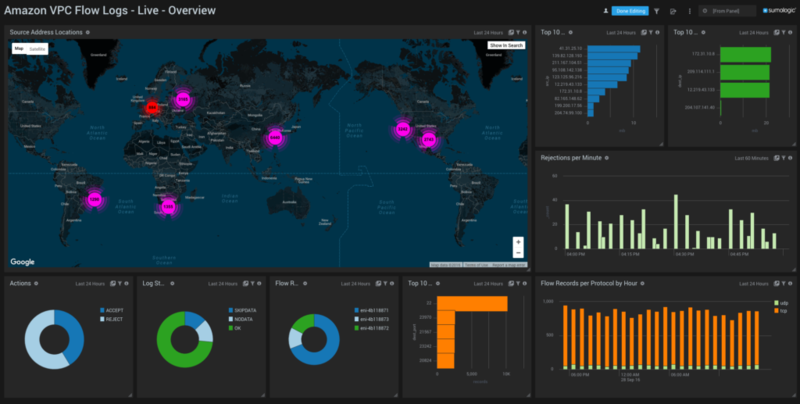 Our interactive dashboard puts global real-time control of AWS traffic in your hands. With the click of a mouse, zoom from orbiting view to the source of a success or challenge and share it instantly with appropriate team members. The Sumo Logic app lets you maximize the power of AWS VPC Flow logging, turning torrents of raw data about the traffic to, from and within your VPC into clear information you can use in real-time. But not all, or sometimes even most, traffic in your AWS environment is friendly. Companies like Symantec react daily to an endlessly renewed stream of potential threats ranging from denial of service (DNS) attacks to malware to ransomware, which can assault your data and literally take parts of it hostage. The Sumo Logic app dashboard instantly addresses top threats, visually sorting malicious traffic by region and tracing it destination IP addresses. By viewing danger trends as they happen and over developing arcs, you can protect your AWS services with proactive defense measures like ACL adjustments, security device upgrades, or additional staff. Sumo Logic makes your AWS VPC Flow problems visible, and thus solvable.